January 2016 UPDATE: The PDX Holiday Food Donation Drive raised $388.11 for Urban Gleaners, enough to cover fuel and vehicle costs for 30 round trips to PDX to pick up donated food! 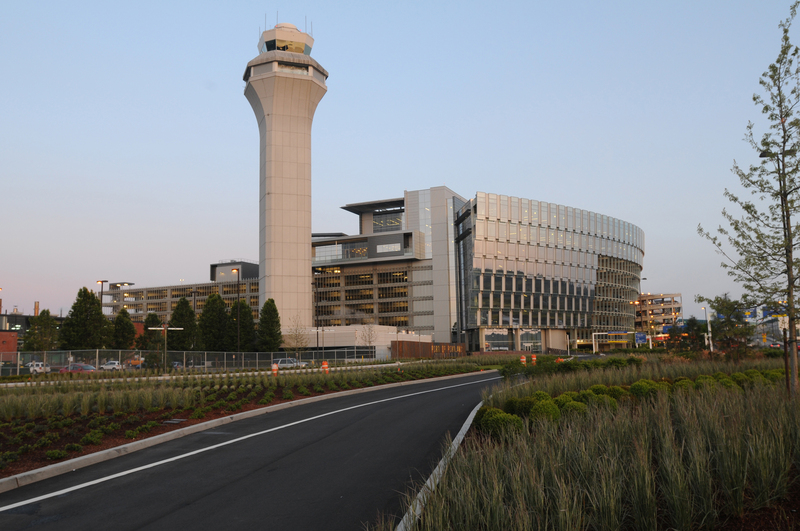 Check out how the program stacks up against other airports across the country in this USA Today article. Urban Gleaners is PDX’s partner in the food donation program – connecting tons of donated food from airport businesses to families in need. But what happens to donated food once Urban Gleaners picks it up from PDX? In this behind-the-scenes look, we learn about the program background and logistics of delivering food to people that need it. After regularly seeing a lot of good food in compost bins at the airport, the Port’s Waste Minimization team partnered with the PDX Concessions Operations to implement a food donation program. The program at PDX allows restaurants to donate unsold, ready-to-eat food products such as sandwiches, salads, parfaits, baked goods, and produce. So far, Portland International Airport businesses have donated over 180,000 pounds (90 tons) of food, or over 120,000 meals, since the program began in February 2013. 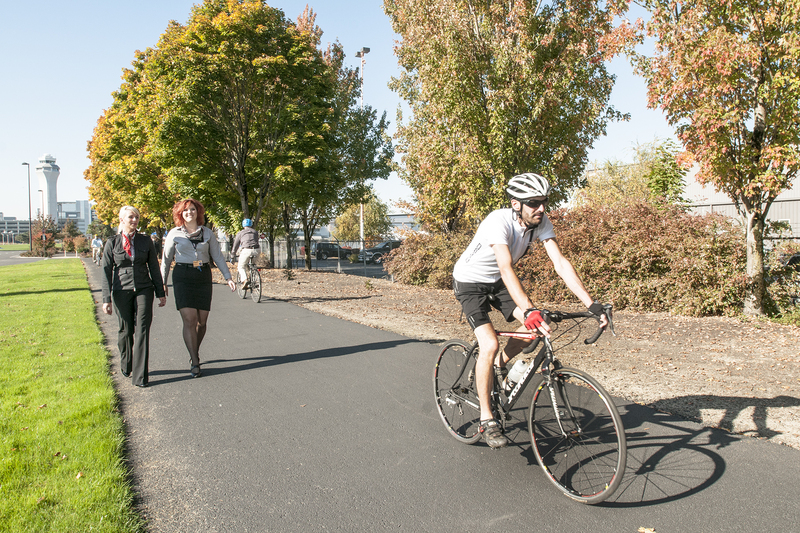 The Waste Minimization Team is a partnership between the Port of Portland and Portland State University’s Community Environmental Services program. 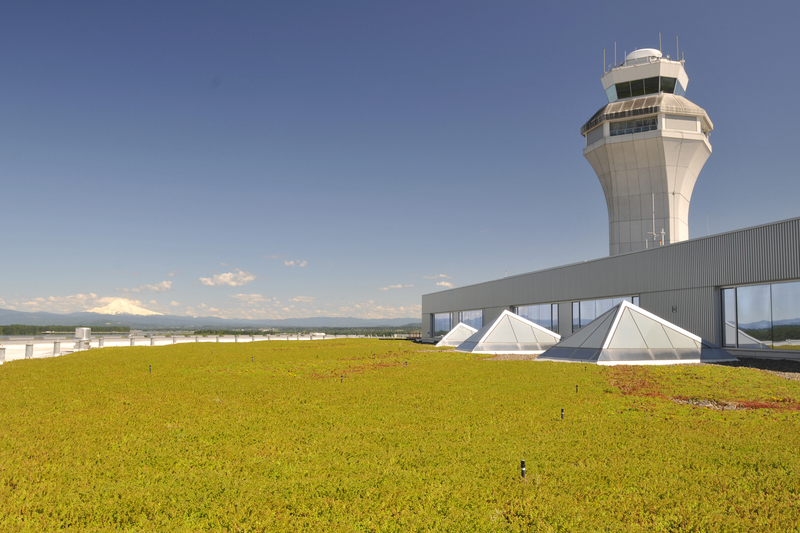 The team leads innovation in waste minimization at PDX and other Port facilities. Closing the loop and connecting good food to families helps achieve the Port’s environmental policy and sustainability focus. 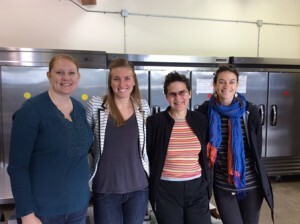 Erin Anderson (left), Kaileigh Westermann (middle left), and Grace Stainback (far right) of the Port of Portland’s Waste Minimization Team toured with Diana Foss (middle right), Urban Gleaners Director, to learn more about the food donation process and where food is delivered after it leaves PDX, November 2015. Urban Gleaners makes three weekly stops at PDX to pick up food from a common refrigerator and shelving area that serves as centralized, storage location for donated food from all participating airport businesses. Once picked up, the truck brings food to the Urban Gleaners facility where it is sorted for distribution. 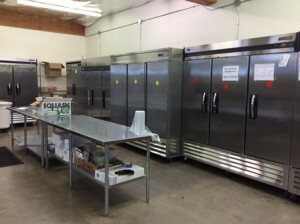 At the Urban Gleaners facility, a large row of refrigerators serve as holding areas for perishable food. Red means it is ready for volunteer sorting, yellow means the food can wait a day to be distributed and green means the food is ready to go out into the community. 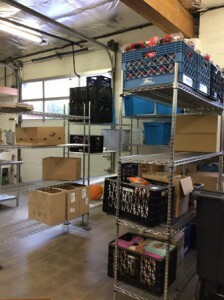 Shelves hold non-perishable food items and organize boxes ready for delivery to drop-off locations. PDX airport vendors are one of the largest weekly donors, according to Diana Foss, “Our partnership with the PDX food donation program expanded the number of people we have been able to reach with good, nutritious food.” Many other Portland organizations contribute, including New Seasons, Dave’s Killer Bread, Simpatica Catering, Hopworks Urban Brewery and Whole Foods locations. Professional groups with leftover food after catered events frequently call for pick-up. Urban Gleaners has a dynamic, committed group of organizations that support their mission ”to help alleviate hunger by collecting edible, surplus food that would otherwise be thrown away and redistributing it to agencies that feed the hungry” Check their website for the latest information: http://urbangleaners.org/partners. 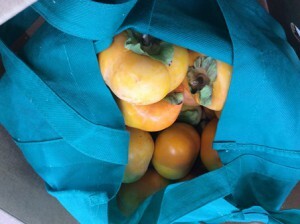 The Portland Fruit Tree Project donates fresh produce to Urban Gleaners, such as this recently donated bag of persimmons. Several PDX businesses have teamed up to offer a Holiday Food Donation Drive December 20-26, 2015 by offering passengers the opportunity to donate $1 to Urban Gleaners with their purchase. Partners include Burgerville, Elephants and MOD Pizza. In addition, Panda Express is sponsoring a special luncheon for an Urban Gleaners school partners in early December 2015. Port of Portland and PDX businesses are proud to partner with Urban Gleaners to help feed families in need this holiday season, and all year-round!